Kirill Gerstein’s playing is distinguished by a discerning intelligence, great virtuosity, and a clarity of expression. He has been described as “Gloriously free and unfazed by technical difficulties, he made the piano sing…" (Leipziger Volkszeitung). A prolific composer whose work is in demand across the globe, Thomas Adès is also a highly regarded pianist who made his Carnegie Hall debut in 2007. 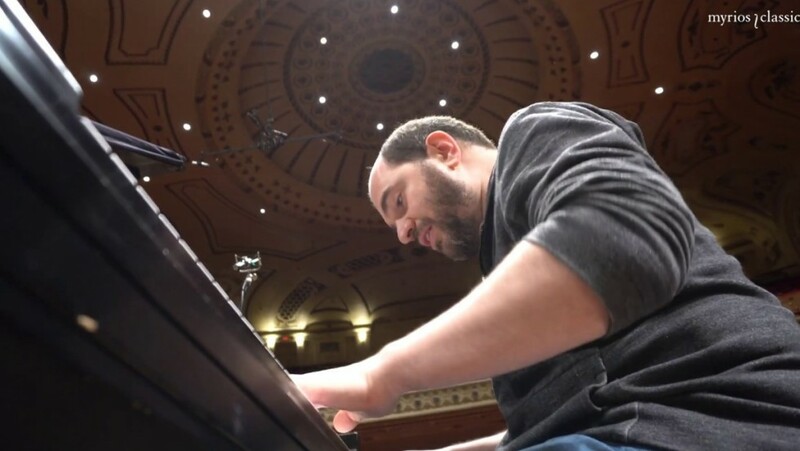 Kirill Gerstein plays "I Got Rhythm"
Between the distress caused by World War I and mounting health problems, Claude Debussy (1862-1918) seemed to be fading, physically and creatively. But then he spent the summer of 1915 at a coastal town north of Paris on the English Channel—close enough to the front lines that he could sometimes hear shells—and in that period he experienced a late burst of productivity that brought forth the Cello Sonata, the Sonata for Flute, Viola, and Harp, and two landmark keyboard works: the Etudes for solo piano, and En blanc et noir for two pianos. 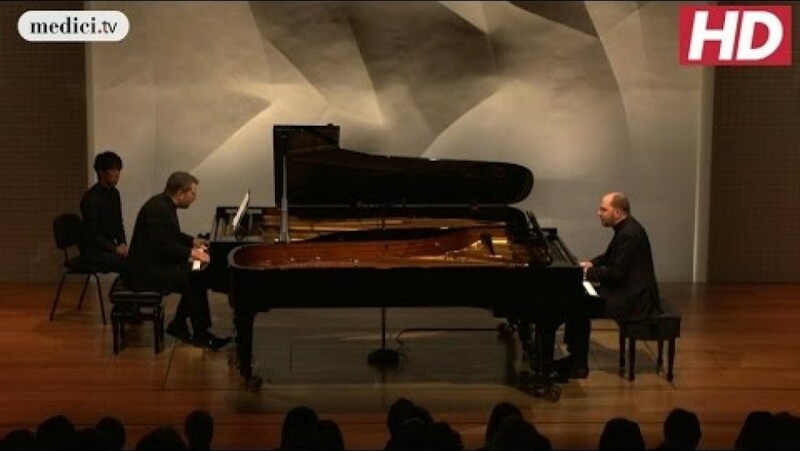 The title “In White and Black” refers most concretely to the piano’s keys, but it also seems to hint at the stark divides at the heart of this wartime piece. Debussy printed an epigraph above each movement; for the first, this quote from the libretto to Gounod’s opera Roméo et Juliette operates as a call to action: “He who stays in his place and does not dance, quietly admits to a disgrace.” The whirling music has something of a waltz flavor in its three beats, played at a brisk tempo marking that translates as “heatedly” or “with excitement.” The somber and conflicted second movement, dedicated to his publisher’s cousin killed in the war, uses a heading from a 15th-century ballad “against the enemies of France” by François Villon, with quotes of Lutheran chorales standing in for the German enemies. The finale uses another quote from Villon, declaring, “Winter, you’re nothing but a villain.” The marking of “scherzando” (“joking”) emphasizes the discomfiting giddiness of this airy and adventurous music, which Debussy dedicated to Stravinsky. As the musical language of Igor Stravinsky (1882-1971) evolved from the wild, folk-influenced primitivism of his early Russian ballets to the cool, fractured neoclassical style forged during his European exile, one fascination remained constant: the power of ritual. This thread runs from The Rite of Spring through the clangorous ballet The Wedding (for chorus, percussion and four pianos) and on to such neoclassical highlights as the oratorio Oedipus Rex, plus another related work for orchestra and chorus singing in Latin, Symphony of Psalms from 1930, with the sacred texts for the three movements drawn from biblical psalms. This transcription for two pianos was the work of another Russian powerhouse, Dmitri Shostakovich (1906-1975). It was the type of arrangement he used in the course of teaching piano at the Leningrad Conservatory, and even though he never attempted to publish it, he did gift a copy to Stravinsky during a landmark visit to the Soviet Union in 1962. Reducing the amassed forces of chorus and orchestra down to two pianos brings out the clarity of the harmonic movement and layering, especially in the fugal second movement. For Witold Lutosławski (1913-1994), arguably Poland’s greatest composer since Chopin, the path to his creative maturity was first a matter of survival. Born in Warsaw, his Polish family sought refuge during World War I in Russia, until his father was executed by a Bolshevik firing squad after the Revolution. Between the wars, Lutosławski studied piano and composition at the Warsaw Conservatory, until his own compulsory military service began. He was captured by the Germans, but soon escaped back to Warsaw; he fled again as his hometown plotted an ill-fated uprising, and he lost most of his early compositions in the destruction that followed. One of the few scores he safeguarded was his set of Variations on a Theme of Paganini, which he completed in 1941, and which helped him survive the war when he and a composer friend took to gigging as a piano duet in cafés. In adapting the famous Caprice No. 24 in A Minor for solo violin, Lutosławski kept most of Paganini’s variations intact, with the original violin figurations embedded within dizzying layers of sound from two boisterous pianos. Thomas Adès (b. 1971) wrote his first serious compositions at age nineteen, a year after earning second place in the BBC’s “Young Musician of the Year” competition as a pianist. At 24, he completed the landmark chamber opera that helped launch his international reputation: Powder Her Face. The opera’s Duchess character was based on Margaret, Duchess of Argyll, whose 1963 divorce captivated the British public when her husband produced salacious photographs and a list of 88 suspected lovers. Adès transcribed four scenes for solo piano in 2009, and he expanded this Concert Paraphrase on Powder Her Face into a piano duet in 2015. To honor Johann Strauss II, the “Waltz King” who died in 1899, Maurice Ravel (1875-1937) began a work entitled Wien (“Vienna”) in 1906. He shelved it at the time, but he revisited the concept in 1919 to fulfill a commission from the dance impresario Serge Diaghilev. He completed the orchestral score, recast as La valse, in 1920, and he also arranged versions for solo piano and two pianos. Ravel played the two-piano version for Diaghilev, who rejected it, declaring, “It is not a ballet; it is a portrait of a ballet,” a comment Ravel never forgave. The single-movement composition follows a basic scenario outlined by Ravel in the score: “Swirling clouds afford glimpses, through rifts, of waltzing couples. The clouds scatter little by little; one can distinguish an immense hall with a whirling crowd. The scene grows progressively brighter. The light of the chandeliers bursts forth at the fortissimo. An imperial court, about 1855.” The one undeniable constant is the waltz, ceaselessly pulsing its three measured beats through lovely melodies and grotesque disturbances.